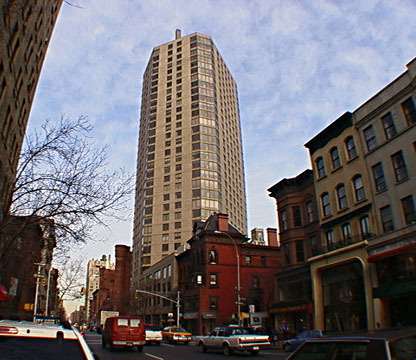 With its unusual angled facades and high visibility, this tower is one of the landmarks of the Carnegie Hill neighborhood and its creation is a fine testament to the earnest efforts of community leaders to preserve the quality of their neighborhood. The distinctive massing that emphasizes large bay windows looking south down Madison Avenue and its asymmetrical facades make its otherwise somewhat bland pale beige masonry facade quite palatable and its considerable height gives its residents spectacular views. 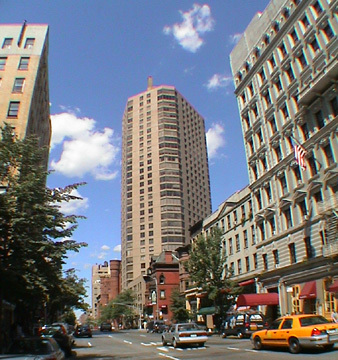 The 32-story building, which was designed by Edward V. Giannasa for developers Frederick DeMatteis and Charles Shaw and completed in 1983. It is finely detailed and has a very handsome retail base. The building's location, in fact, has constantly improved with new and charming nearby restaurants and boutiques. 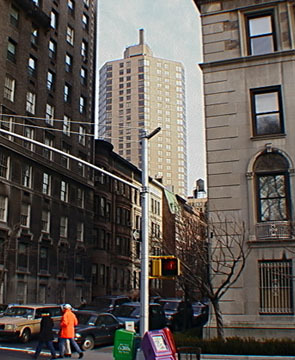 Whereas the Upper East Side north of 86th Street was long considered rather declassé, this particular area is now prime, especially for families as many prestigious private schools are also nearby. The project, however, had a difficult birth, but a happy ending. H. R. Shapiro, a leading residential developer who first launched this project encountered serious opposition from residents on the street who hired their own architects, Terry G. Twitchell and Nancy Al-Tseng Miao, to design an alternative to his. 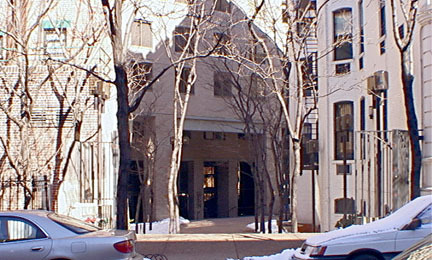 After considerable controversy, the developer agreed to a special zoning amendment for the street and the community design for which he received a "density" bonus for preserving an apartment house known as the Alamo at 55 East 93rd Street, and creating a mid-block mews. Philip Birnbaum and Greene and Partners where the developers' architects. Shapiro, however, subsequently encountered financial difficulties and was replaced by DeMatteis and Shaw. The sensible preservation plan helped minimize the impact of the tower in the neighborhood while preserving an attractive older property and minimizing the impact of relocation of a affected residents. 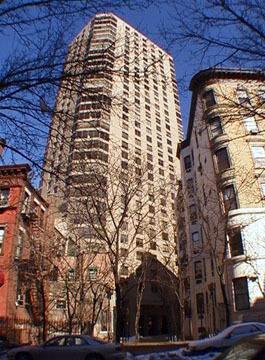 The tower is directly south of the "ruins" of the Squadron A Armory on Madison Avenue behind which there is a very large playground that is part of the Hunter College Campus Schools that originally was Internmediate School 29, designed by Morris Ketchum Jr. & Associates in a style to complement the fortress-like design of the former armory. 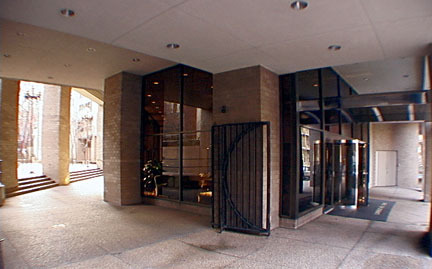 There are 223 condominium units in this building, whihc has a health club and pool and sundeck. The design of the plaza that extends to 93rd Street is very attractive and gives the low-rise Alamo building much higher visibility.